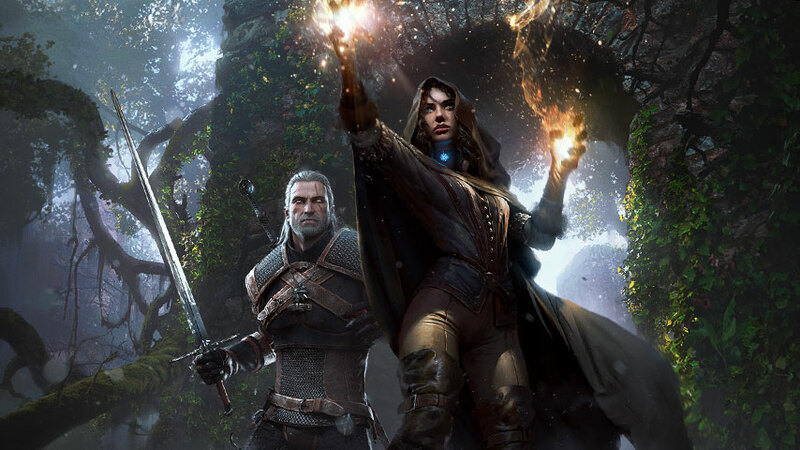 The Witcher 3’s main quest continues with Lilac and Gooseberries, the scent of the sorceress Yennefer. Turns out it was all a dream. Before we set off on our journey, here’s a good chance to talk about the dialogue system. The top choices, in bold yellow, will always advance the conversation to the next choice. The less emphatic dialogue prompts below are optional, and will fill you in on background information before returning you to the mandatory choice. Explored dialogue options appear in white. Chat with Vesemir, then battle a handful of Ghouls. You draw your silver sword automatically, but on the off-chance you miss the tutorial prompt here, know that a silver health bar above an enemy’s head indicates it is a magical creature and should be battled with a silver blade, not steel. Vesemir is a big help here; the Ghouls tend to focus on him initially. Pick one and flank it; on standard difficulty, you should be able to take it down with a light-light-light-heavy combo. If you’re quick, you kill two Ghouls this way before they focus on you. When you have their attention, use parries to fend them off and look for an opening, then strike. As long as you don’t get yourself in a pincer situation, you’ll be fine; try rolling away to break free if you do. Use Quen if you need to, but be aware that opening the quick access menu does not stop time. You can meditate for an hour if you need to restore Vitality (HP). Other methods of health regeneration include food and drink; you can equip these into quickslots on the D-pad (up and down) for easy access. Approach the Ghoul’s bodies and press X/A to collect any loot; Triangle/Y will collect all. Use Witcher Senses to easily spot loot bundles and nearby plants with crafting ingredients. Use Witcher Senses to look around and you can find a crystal skull. When you’re done, double tap L3 to call Roach, your horse. Press X/A to mount. While riding, hold X/A to canter, or double tap X/A to gallop. Roach has limited stamina though. If you canter on a road or path Roach will automatically follow it without you steering, so you can look at the scenery. Ignore the side paths and village for now and just follow Vesemir; we’ll be back here soon. You’ll come across a griffin which thankfully isn’t interested in you; it will mess you up at your low level, seriously (you can wander off the main path at any time and access higher level areas, where monsters will instantly kill you). Once it wanders off, you can ask the merchant for a reward (50 crowns) or tell him you don’t want one for some help in the next hub. The game wants you to go see how your bestiary works now, so follow the tutorial prompts. Unlike other games, the bestiary is actually really useful, because you need to know enemy weaknesses to really succeed in combat. Remember it if you struggle with any encounter. Follow Vesemir to reach the first hub: White Orchard. The game prompts you to dismount (hold Circle/B) but if you ride into the stable yard at the inn behind Vesemir you’ll automatically dismount anyway. Inside the inn, admire the local pottery and get a quick and dirty intro on local politics; Temerian rule has been displaced by Nilfgaard, and nobody likes witchers much. If you refused a reward earlier, the innkeeper here is more friendly to you. She operates the first shop you encounter; use the dialogue option marked with a purse to access it. She has food, alchemy ingredients and Gwent cards – more on that later. You don’t have anything worth selling. Now that you are a free agent you can chat with Vesemir about your past adventures. A couple of peasants near by are quite rude, but you can use a Sign on them in conversation to get information on Yennefer. Around the corner you’ll find a couple more peasants and a scholar who will teach you to play Gwent when you’ve finished chatting with him. You can play this card game at most hubs. It’s not super intuitive so pay attention to the tutorial. Your best bet is to play until you have about six cards on the table but some okay ones in reserve, then pass, losing the first round; you should easily beat your opponent in the next two rounds, as he’ll mostly have weather cards left, and you will get to draw an extra card. Completing this game triggers the Collect ‘Em All secondary mission. Buy some cards from the innkeeper here if you can afford them. At the back of this area you’ll find Gaunter O’Dim. He’ll give you the information you need to move on and out of this hub – eventually. That’s all you need here, so exit the inn. Outside, you’ll trigger an encounter. Use a Sign to earn some extra experience, then battle two of the three brawlers. Your next main quest objective is to the north, but if you want to, you can send some time side questing in the surrounds. If you prefer, we can do that later; I’ll let you know when we’re leaving the area. When you’re ready to move on, follow the trail makers to the Nilfgaardian garrison. On the way you’ll encounter various points of interest. Be careful in the cemetery if you didn’t go side-questing; the level seven Wraith here is probably beyond you right now. Watch out for the level five wolves near another Guarded Treasure after you ford the river, too. At the Garrison, climb the stairs and speak to the guard. Head through the wooden gates – they’ll open as you approach – and through the camp to where the commander awaits; the guards here don’t have much to say to you, but their chatter is kind of interesting. The commander dispatches you to battle the griffin, triggering a new mission – The Beast of White Orchard. Exhaust the commander’s dialogue to receive two objectives. Grab the nearby weapon damage boost before you leave. Don’t worry, completing this new mission is a necessary step for Lilac and Gooseberries; continue following our guide through The Beast of White Orchard. Onwards to The Beast of White Orchard walkthrough, or back to The Witcher 3: Prologue (Kaer Morhen and White Orchard) walkthrough.